"Paranormal Witness," is a SYFY Channel original series that centers around people's paranormal experiences. These can range from ghostly encounters to alien sightings, out of body experiences or angel visitations. Anything that can not be readily explained is included in this documentary style show. Each episode is one hour long and is done in a first person story telling style. People that have paranormal experiences are interviewed and they give their account as to what happened. Any actual film or footage that as taken at the time is also included in the story telling. As the individuals involved in that weeks episode tell their story, a number of actors who represent the real life people reenact their tale. You actually get to see their paranormal experience as if you were watching a horror show. These are real life documented stories told by the people who lived through the experience. In most cases as an episode comes to an end there is some form of closure to the paranormal experience. Some examples are the family moving from a haunted house or tenants performing a ritual to stop a haunting. However, in some cases such as alien encounters, you can see that even after investigating with air traffic control and police helicopters, the foreign object still could not be explained. Some stories can be frightening and other enlightening. Some actual footage can be disturbing to viewers. This show is not intended to be seen by young audiences and for this reason, is aired in the evenings. The town of Santa Susana Knolls, California is known for its troubled past with biker gangs and violence. When a woman rents out the dilapidated guesthouse of her newly purchased home, strange occurrences take place. A young couple on a sightseeing trip to Point Pleasant enter an old munitions bunker and incidentally awaken the infamous Mothman - a harbinger of doom that follows them home and terrorizes them. When a war veteran gets a new job in Lawton, Oklahoma, his brothers and their significant others all decide to move with him and make a fresh start together. But their dreams are destroyed by a malignant demon known as The Zozo. When a loving Christian family learns a mysterious and evil 'Tall Man' is stalking their home, they are shocked to discover their eldest son is to blame. For he has entered into a deadly contract ...with the Devil. Episode 3 - From H.E.L.L. The Ouija Board comes with three cardinal rules designed to protect the user from opening a door to the "other side," but when three young girls from a Hispanic family decide to break all three, they incidentally open a gateway to hell. When 3 young college students move into a rental property in a rundown neighborhood of Savannah that has a reputation for being haunted, they never expected to come face to face with the spirit of a demented crack fiend. Inspired by "To Kill a Mockingbird" author Harper Lee's alleged journey to Alabama to research a mysterious preacher accused of murder and voodoo, writer Jenny Scott follows in her footsteps, only to suffer terrible consequences. When Amanda and Chris Engler moved with their little daughter into the house once owned by Amanda's grandmother, they thought their life was blessed. In summer 2009, eight U.S marines were sent to guard an ancient outpost in Afghanistan that had seen battled for over centuries of war. The marines soon realized they were sitting on a graveyard and that they faced a ghostly enemy that no military training could ever prepare them for. Three brokenhearted women renting an old house together seek a fresh start, but instead get what they believe is a supernatural tormentor who is preaching about hell and brimstone. Terrorized by malicious forces, Carolyn and Roger Perron and their five daughters endured physical attacks, ghostly sightings and a life-threatening curse, culminating in the near death of Carolyn. Jeanine and AJ Bertholt thought they had bought their perfect 'forever' home. But after discovering satanic symbols carved into the floorboards, the family begins to realize something else is in the house with them - a dark, terrifying demon that wants Jeanine's soul. A family is terrified of what they describe as a darkness that lurks beneath the inky water of a pond at the back of their property. A woman wracked with guilt over her grandfather's death believes he is haunting her and her family. On Heather Platt's sixth birthday, she was given a life-sized doll. 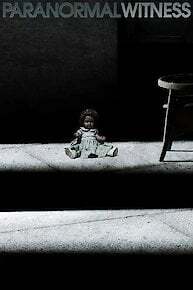 The Doll, possessed with demons, would destroy Heather's family until she had what she wanted - the little girl's soul. A Pennsylvania politician battles with the ghost of a murderous doctor and an ancient pagan god that the doctor once worshipped. Three female college students claim they're being tortured by a demon woman hell-bent on tearing their lives apart. In the season premiere, the owners of an abandoned motel are tortured by an evil entity. Paranormal Witness is currently available to watch free on NBC, Syfy and stream on Syfy. You can also stream, download, buy, rent Paranormal Witness on demand at Amazon, Vudu, FandangoNow, Google Play, DIRECTV NOW, iTunes online.